It’s been a long and, at times, rather confusing summer for Polonia Warsaw. However the wait for the new season to start is almost over: on Saturday the former Ekstraklasa club will play its first IV liga (5th tier) game at KS Łomianki. The Polish media have already warned of possible security problems between travelling Polonia fans and Łomianki’s Legia-supporting fanbase. There should be a tense and exciting atmosphere when the two sides take the field at 15:00 CET. But who will represent the new Polonia on the pitch on Saturday? Several days ago the club finally released a 25 player squad list to the media. This post will look a bit more closely at the players on that list and make some tentative conclusions regarding what we can expect from Polonia over the coming season. Do the players have what it takes to achieve promotion or will they become mired in bad pitches and poor refereeing? Paweł Błesznowski – Date of Birth (DoB) : 31/03/83. Age: 30. The most controversial member of the New Polonia. Formerly of III liga (4th tier) Warsaw area side Legionovia Legionowo, many supporters do not want Błesznowski at the club after a photo was found of him holding up a Legia scarf. It remains to be seen whether the fans warm to him or not. Dominik Budzyński – DoB: 02/06/92. Age: 21. Budzyński is a highly-regarded goalkeeper from the Polonia youth system who represented his country at the u-19 level. He played twice for Polonia in the Polish cup last season and then 16 times for II liga (3rd tier) Radomiak Radom. It seems likely that Budzyński will be offered a contract somewhere else and will thus not start the season at Polonia. Michał Dudek – DoB: 30/12/94. Age: 18. Another graduate of the Polonia youth system, Dudek played 11 games in goal for III liga Pogoń Grodzisk Mazowiecki last season. If Budzyński leaves and Błesznowski is unpopular Dudek could well end up as Polonia’s first-team keeper. Tomasz Dudek – DoB: 01/04/85. Age: 28. Dudek played five games for the then second division Polonia in the 2006-7 season. He is most known for playing regularly with KP Piaseczno in the Polish fourth tier from 2008-2012. As one of the oldest players on the new Polonia a lot of responsibility will be placed on his shoulders. Aleksander Fogler – DoB: 30/05/92. Age: 21. Another Polonia youth-team graduate, Aleksander’s family is strongly linked to Polonia. His father was Polonia’s technical director and his brother is a former goalkeeper at the club. After several appearances for Polonia’s Młoda Ekstraklasa side, Fogler moved on to III liga Start Otwock where he appeared 17 times last season. Daniel Grala – DoB: 01/02/92. Age: 21. Daniel is one of the few players with no former links to the club. Grała was a regular starter last season for III liga Orzeł Kolno, a club from Poland’s Northeastern Podlasie province. Michał Jagodziński – DoB: 29/09/89. Age: 23. Jagodziński is a graduate of the famous Agrykola youth system. He then went on to have several relatively successful seasons at II liga Świt Nowy Dwór Mazowiecki before dropping down to the 4th tier with Ursus Warszawa. Should have no problems in the IV liga. Maciej Joczys – DoB: 11/03/92. Age: 21. Another Polona youth system player. He appeared regularly for Polonia’s Młoda Ekstraklasa side last season and even played in Polonia’s Ekstraklasa season finale in Szczeciń. Jacek Karbowniak – DoB: 04/06/94. Age: 19. A former ŁKS Łódź and Polonia youth player, Karbowniak appeared 17 times for Legionovia Legionowo in the III liga last season. Kacper Lachowicz – DoB: 23/04/95. Age: 18. Kacper is a talented youngster who came to the club from 6th tier Marcovia Marki where he worked with the new Polonia’s assistant manager Emil Kot. Damian Maleszyk – DoB: 22/03/92. Age: 21. Damian is also a graduate of the Polonia youth system, making a number of appearances for their ME side three years ago. Maleszyk played alongside Fogler at Start Otwock last season. Maciej Biernacki – DoB: 05/03/87. Age: 26. A graduate of the lauded, silver-medal winning 1987 Polonia youth team which also contained Deportivo La Coruna’s Cezary Wilk and Korona Kielce’s Daniel Gołębiewski, big things were expected of Biernacki. Unfortunately injuries put paid to his attempts to succeed at a higher level. Last season however he helped III liga Huragan Wołomin to promotion. Biernacki’s a jovial character and a lot will be expected of him this season. He should be one of Polonia’s leaders on the pitch. Bartłomiej Gołaszewski – DoB: 09/09/88. Age: 24. Bartłomiej is another player with strong links to Polonia. His dad is Polonia legend Igor Gołaszewski who won the league with the club in 2000. A fact that will make Bartek a popular figure for the club’s fans. He’s another member of the successful 1987 Polonia youth side, after this he made sporadic appearances for 2nd and 3rd tier sides before ending up at Skra Konstancin Obory in the 6th tier. Bartłomiej Kucharski – DoB: 07/07/95. Age: 18. Not much is known about young Kucharski but he played three games for Polonia’s ME last season. The next 10 months should tell us more. Marcin Kur – DoB: 22/02/92. Age: 21. Another to add to the list of Polonia youth team graduates, Kur dropped right down to last tier Orzeł Kampinos last season. Known for being a bit of a big-time charlie, Kur now has a great chance to make a name for himself. Rafał Linka – DoB: 03/10/91. Age: 21. Another talented youngster Rafał played for Klasa A (7th tier) Mazovian province side KS Pniewo under the management of Emil Kot. He now has the chance to prove himself on a much bigger stage. Danilo Radjenović – DoB: 05/09/94: Age: 18. Patryk Strus – DoB: 1995. Age: 18. Strus, like Lachowicz, is another player who played under Emil Kot at Marcovia Marki last season. Supposed to be very talented. Piotr Tyburski – DoB: 10/01/94. Age: 19. Tyburski started out at II liga Olimpia Elbląg before ending up at Widzew Łódź. At Widzew he played regularly for their Młoda Ekstraklasa side. Last season he appeared eight times for II liga side Siarka Tarnobrzeg. Aleksander Majerz – DoB: 16/06/95. Age: 18. Another graduate of Polonia’s youth system Aleksander almost had trials for Manchester United when he was 15 years old but unfortunately broke his leg. Supposedly very talented. Edgar Ghazaryan – DoB: 1993. Age: 20. Polish Armenian Ghazaryan started out in the same Polonia youth team as current Legia player Patryk Mikita. As a teenager Edgar carried a bit too much weight, maybe one of the reasons he ended up at 6th tier Olimpia Warszawa. Here he is scoring against PKS Radość last season (the first goal on the video). Jacek Kosmalski – DoB: 04/09/76. Age: 36. The most familiar face of all for Polonia fans, ‘Kosmal’ top scored for the club in the 2006-7 season. He also won the golden boot in the III liga (4th tier) in 2010-11 with Pogoń Siedlce. Kosmal is the kind of experienced player that Polonia needs this season, if his legs hold out he should score a good number of goals. Michal Strzałkowski – DoB: 16.10.92. Age: 21. Michał has good experience at a considerably higher level than the IV liga. A graduate of the Świt Nowy Dwór Mazowiecki youth system, Strzałkowski had an especially good year last season scoring seven goals in the II liga. He should be well capable of getting goals this season. Here’s Strzałkowski scoring two goals against Garbarnia Kraków in June (1st and 3rd goals). Marcin Tomczykowski – DoB: 1994. Age: 19. The final player in Polonia’s squad, Tomczykowski formerly played for Robert Lewandowski’s old club Varsovia Warszawa. Not much else is known about him. Whilst it’s difficult to know how well the players will gel, Polonia’s squad seems easily capable of gaining promotion from the IV liga. There are a number of players who have experience of much higher levels of football, with Kosmalski, Strzałkowski and Jagodziński especially standing out. In addition there are players like Kosmalski, Tomasz Dudek and Maciej Biernacki who are mature enough to lead the team. The weakness of the squad is the presence of many young players without extensive league experience. 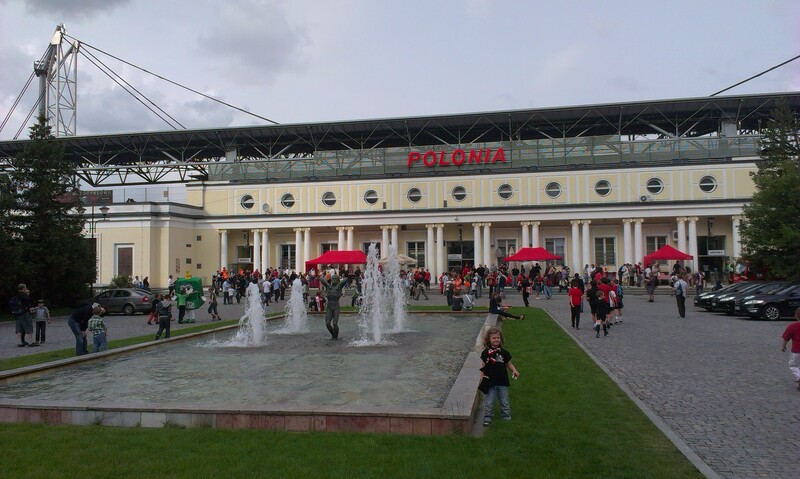 They might find it especially tough to adapt to the worse surfaces in the IV liga and the unpleasant atmosphere at some of Polonia’s away games. It’s going to be an intriguing season on so many levels. I can’t wait until Saturday to see it get under way. This is rightbankwarsaw signing off. Thanks to Marcin Matuszewski for additional advice and tips! This entry was posted in Uncategorized and tagged Jacek Kosmalski, Lower league football, Maciej Biernacki, Michał Strzałkowski, Polish football, Polonia Warsaw, Warsaw. Bookmark the permalink. Dobra robota. Młodość naszej obrony mnie przeraża.